Oneiric | Leah Palmer Preiss ~ Curious Art: Acrylic painting on text collage on canvas, 6"x6"
Oneiric Acrylic painting on text collage on canvas, 6"x6"
Illustrating words for Anu Garg’s brilliant site A.Word.A.Day is a dream gig for me. I’d been a devoted fan for many years before I began this project, & he always chooses such wonderfully evocative words for me to tackle! 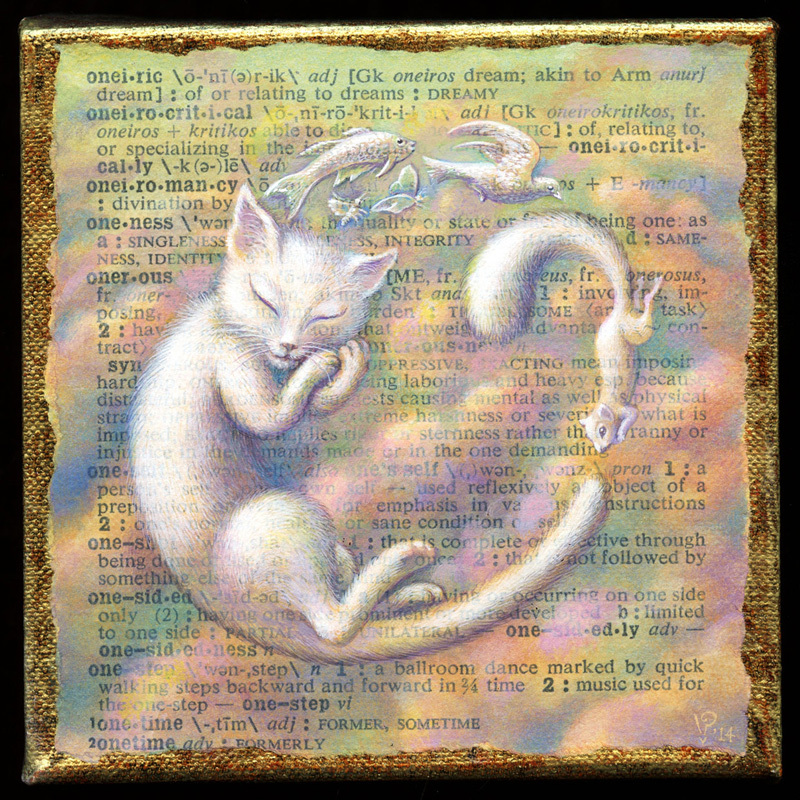 This entry was posted in A Word A Day Illustrations, Paintings and tagged A Word A Day, Acrylic, Alphabet, AWAD 2014, Bliss, Cat, Clouds, Contentment, Dream, Illustration Friday, Painting, Sleep, Soft on 10December 2014 by Leah. Your art is incredible! I love it so much. Thank you so much, Diane! I guess you could say I’m easily inspired, because it can be pretty much anything– I usually just start sketching & something comes out. Sometimes it’s a word or concept, sometimes a line or shape or texture that gets me started. It can be something I’ve seen or something I imagined. Everything makes me want to draw or paint!